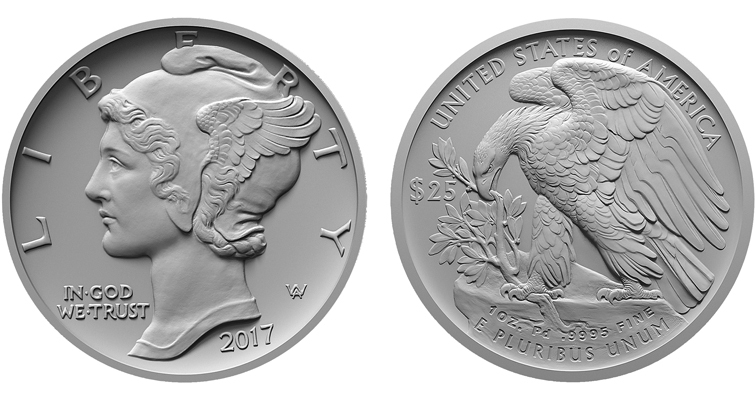 On Monday, the U.S. Mint will begin selling palladium bullion coins to authorized purchasers. The opening price will probably be $976.44 per coin, which is 6.25-percent over the spot price of $919 per troy ounce. Metal prices have not followed a path that market watchers are familiar with. Platinum is usually more expensive per troy ounce than gold but has been less while palladium usually tracks at half of the price of gold. With all of the turmoil in the world, the price of gold is relatively flat with spikes for various activities in the news. But an investor who bought at the beginning of the year “complains” that the price is up only 12-percent for the year despite fundamentals that suggest a larger gain. Recent events have caused the price to jump, but one investor told me that gold is a safe bet but it is not a good bet if you are looking to make money. A dealer that sells silver has called the market schizophrenic. There are swings in the prices that defy market logic. With stricter regulation, higher demand, and flat production growth, the price of silver should be climbing. But it is relatively flat for the year with a 6.4-percent grown. Some are even suggesting that the silver market is being manipulated. I do not know if the market is being manipulated, but the experts are telling me that something is not right. What Is Wrong With Silver: Is It Being Manipulated?